This is a sponsored post on behalf of Illinois Treasurer’s I-Cash. All opinions and statements are my own. The I-Cash program was founded in 1999 with the goal of assisting Illinois residents in recovering their unclaimed assets. 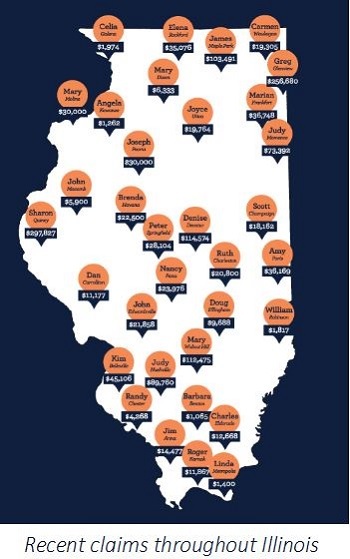 The state is currently safeguarding more than $2.5 billion in cash that needs to be returned to Illinoisans. These assets are transferred to the Treasury after banks, government agencies, and other companies become unable to return them to their rightful owners. The I-Cash website is a fast, free and confidential way for people to discover if they have cash or other assets to recover. The process is simple – enter your name (or a family member or friend’s name) into the search field. If it’s a match, submit the online claim form, and receive your property in an average of three weeks’ time. One in four Illinois adults will discover property to claim, so go take a look! I was absolutely shocked that I had two claims waiting for me, so hopefully you will find yourself in the same boat. Okay, first and foremost, this site is really fun. It may seem really cut and dry, but it’s a kick! I couldn’t help but search everyone I know and send them links to their found cash. I dare you to try searching yourself and then not continuing with anyone else – it won’t be easy! And it’s a treat for them as well, so do everyone a favor and take a look! When you enter your name into the search field, remember to search variations of your name (maiden names, with “Jr.” and without, etc.). I found a single entry under both my married name and my maiden name – and I found money for my father, my grandmother, my mother-in-law and a few friends! When you first search, you will see either a red box that says, “There were no records found for that name” or an entry like mine below. The box will tell you whether you have under $100 or over $100, but you will get a specific amount in the email they send you later. After submitting all the basics to the website (name, address, telephone number, etc. ), you will receive the email within minutes (mine didn’t take more than 10 seconds to arrive). This email told me that I had $5 waiting from my insurance company (who I am still with, so I’m not sure why they couldn’t find me!) and $92.99 waiting from Walgreens! That’s a nice bonus this time of year! Once you get the email, you’ll print it out and read through the instructions. Understandably, they need to make it difficult enough so that Joe Schmoe can’t claim everyone’s cash, but easy enough so that you can claim it yourself without too many hoops. And I think the requirements are totally reasonable. If the claim is over $100, you are required to have the form notarized (free at most banks). For all claims, you are required to prove your social security number (a photocopy of your card, a bank statement with displayed SSN, a tax return, etc.) and if you are claiming on a previous address, something to prove that address (a bank statement, utility bill, tax return, etc.) After collecting everything, you’ll send in your paperwork and wait for your check! If they need more information (probably for those lucky people who have tons of money waiting), they’ll contact you. I have been thinking about what I want to do with my newfound $98 and I keep coming back to the same thing. My husband and I work really hard at keeping our family functioning, getting the kids wherever they have to be, finishing homework, supervising science fair boards and making sure that everyone is alive, happy, well fed and clothed. I think I’d like to take the two of us out to a nice dinner. We need a minute to just take a breath. I’ll be calling grandma in a few days to set up a babysitting date! I really encourage you to take a look through the I-Cash program and see what may be waiting for you. They say that the average claim is close to $2,900, so you may find your next mortgage payment, car payment and holiday gift payments waiting for you with the Illinois treasury! Here’s hoping you do! Thank you for the link. I am going to try it out. Connie, good luck! We hope you have cash waiting for you!